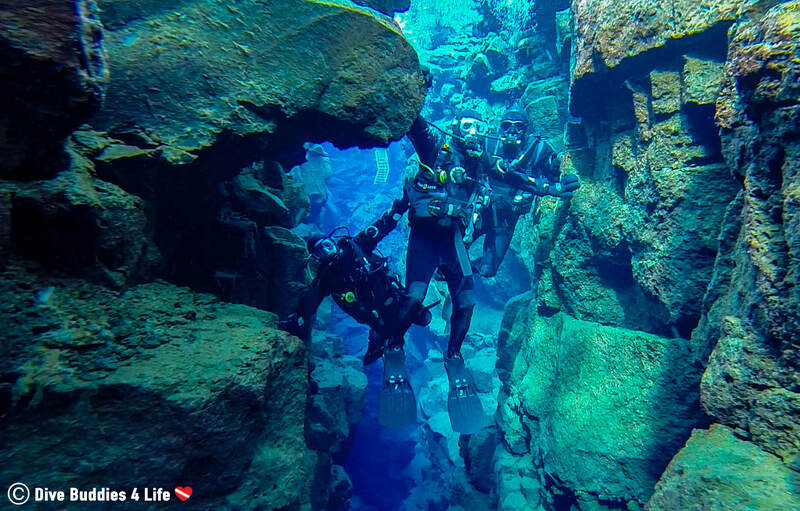 There is no shore diving site quite like the Silfra fissure in Iceland, famous for being, well… a giant crack in the earth. The clue’s in the title, after all! Proximity to the Arctic circle, rapidly changing weather patterns, ancient glaciers… when it comes to cold, Iceland’s got it covered – big time. Iceland is a volcanic island of striking landscapes; skyscraping volcanos, glacial rivers turning into waterfalls, barren deserts where you feel like you’re on the surface of the moon. This Viking country is perhaps best described as the land of fire and ice, in which the regions natural elements come alive in a very extreme way. 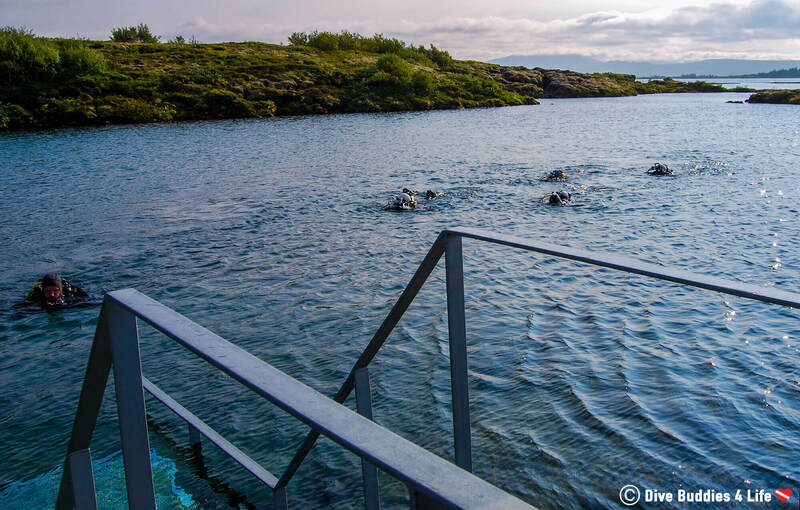 For most, after the unpredictable weather and relatively cold climate, diving in Iceland seems like an absurd idea. 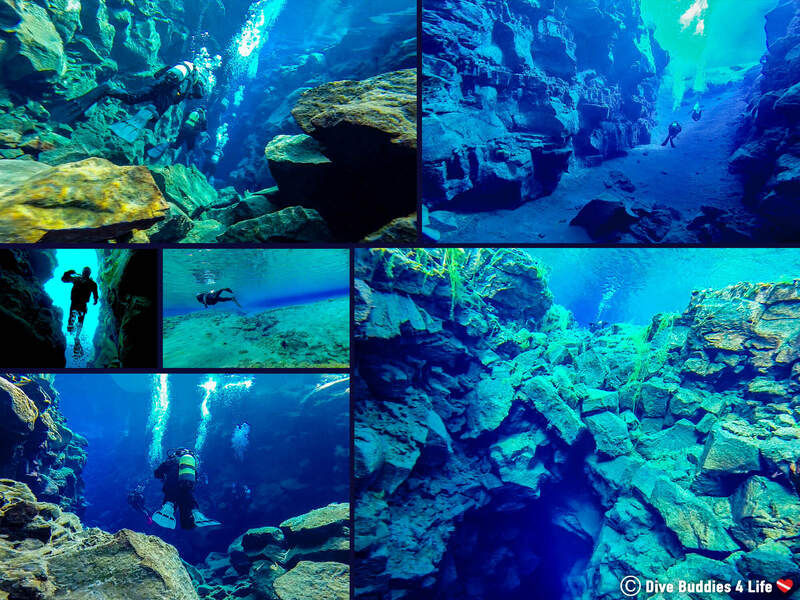 For others, you can’t even mention the country of Iceland without hearing about the world renown Silfra dive site. 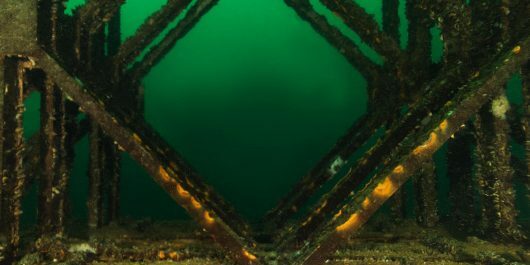 Lucky for us, a little cold never shied us away from trying our hand at diving one of the coldest and clearest diving locations in the world. 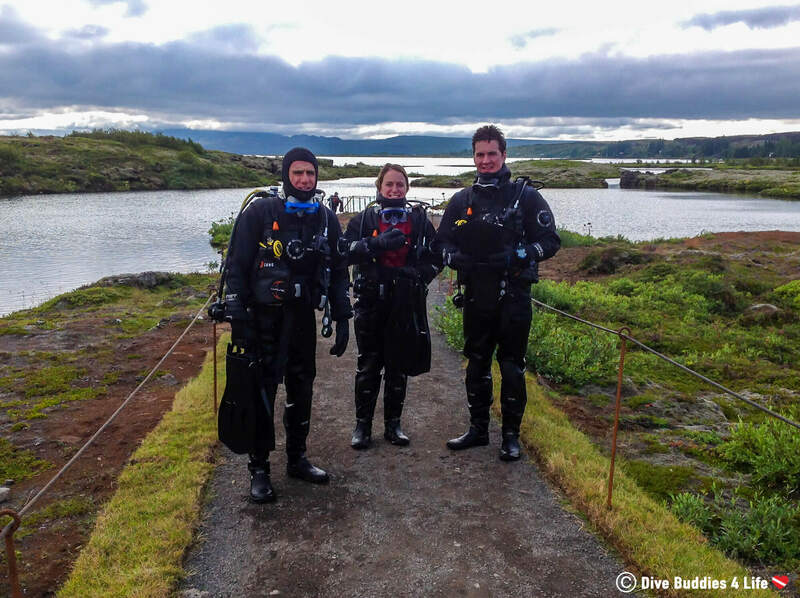 Why is the Silfra a Top Dive Site in the World? 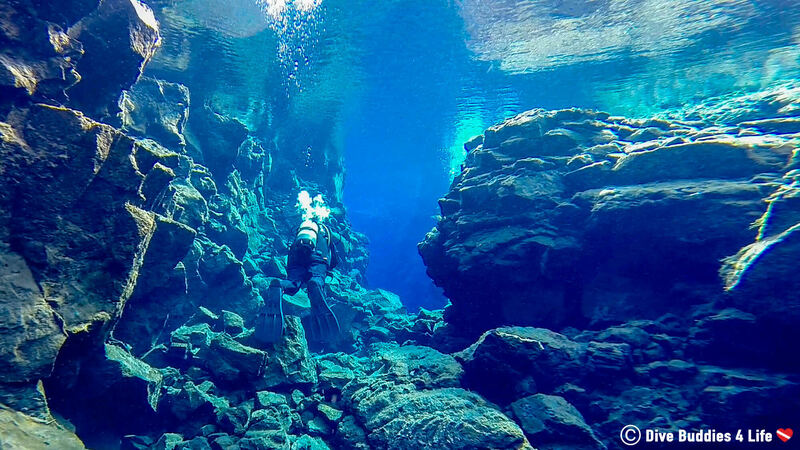 The Silfra is known as one of the top dive sites worldwide for two main reasons. 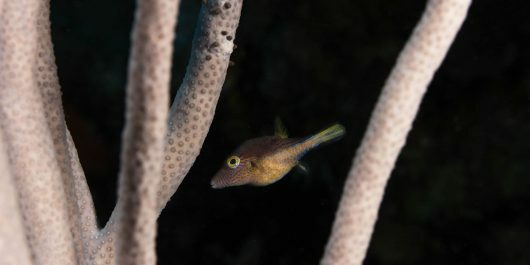 The first being that it is one of the clearest spots to dive with visibility exceeding 100 meters (that’s almost 330 feet!). The unique water clarity comes from melting glacial runoff that is filtered through porous underground lava rock eventually reaching Thingvellir Lake. In total the underground wells that feed the drinkable glacier water to the lake takes about 30 to 100 years to filter the water. 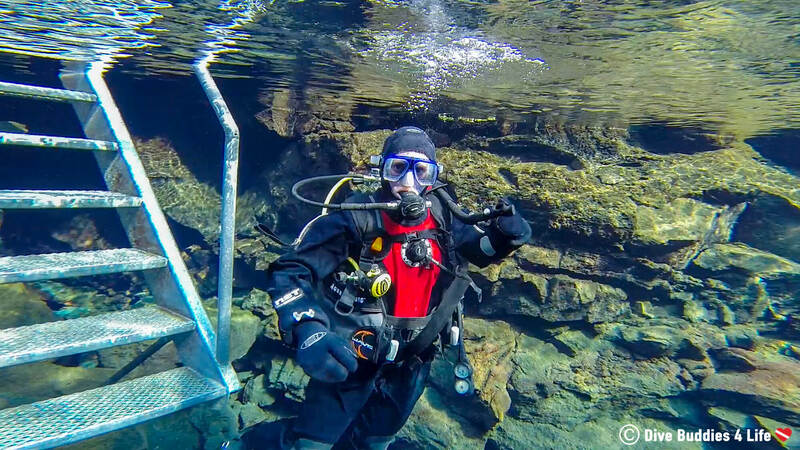 The second reason, the Silfra is a top dive site, is that it is the only place in the world where one can dive between two continental plates, the North American and Eurasian. 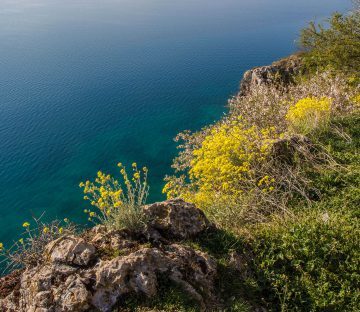 The idea behind continental or tectonic plate theory is that geologically the outermost shell of the planet is sitting on top of a liquid mantle or core of the earth. That shell is split up into eight separate plates or pieces that all fit together like a jigsaw puzzle. These plates are always moving (very slowly that is) creating extraordinary natural landscapes and phenomenon such as mountain ridges, volcanoes, deep ocean trenches, and earthquakes. 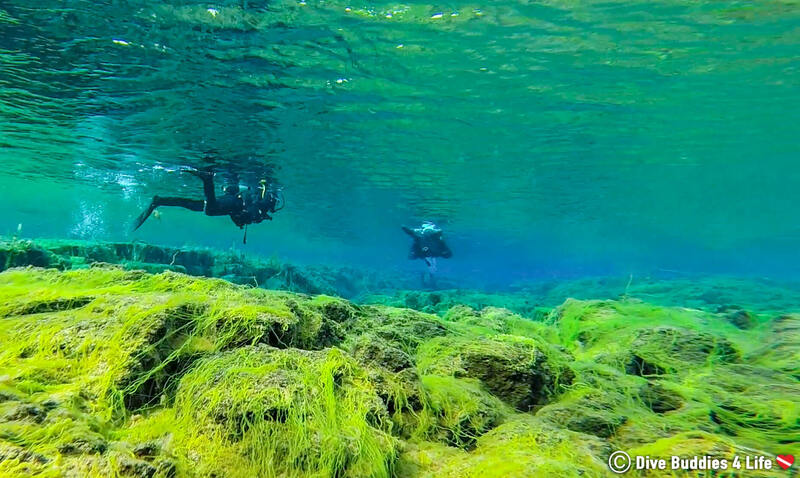 Being avid cold water divers from Canada, Joey and I have had our sights on diving the Silfra for a couple of years. I mean can you really blame us? 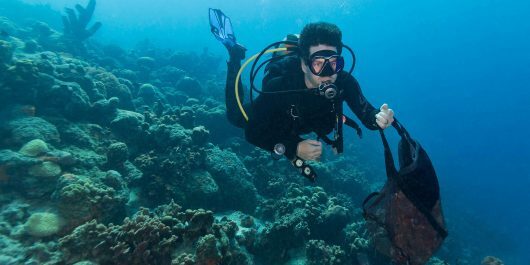 As a world-class dive site, it seems only natural that it would end up on our very ambitious scuba bucket list. 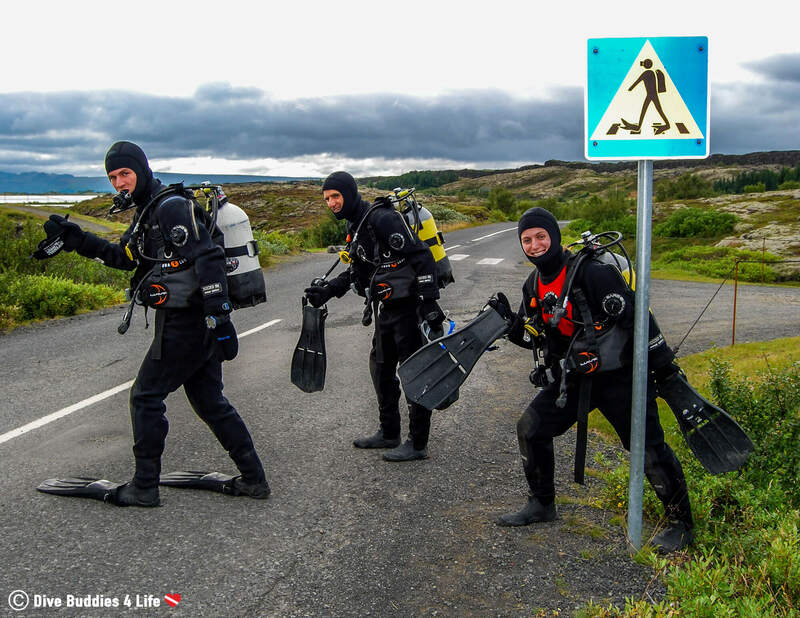 As luck would have it not long after getting our drysuit certification, we planned an extensive camping/road trip around this volcanic island, and as you can probably already tell diving, the Silfra was right at the top of our trip itinerary. 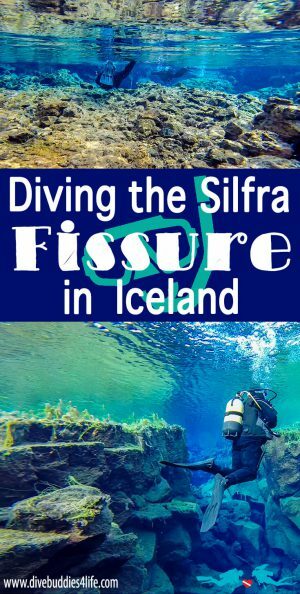 After booking our Silfra diving experience online a couple months in advance of our trip, the day finally came for our excursion with the dive outfitters DIVE.IS. 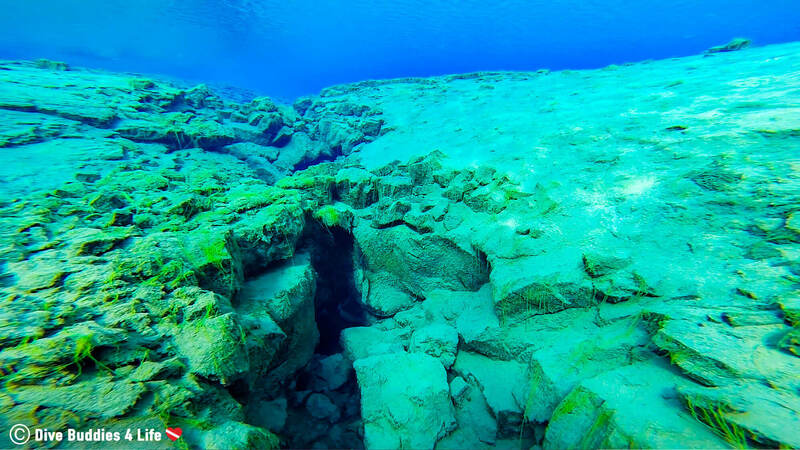 It was about 45 minutes (or 40 kilometers) by car from Iceland’s capital city of Reykjavik to Thingvellir National Park, the site of the world renown Silfra crack. On dive day, the weather was indecisive, but apparently, that’s completely normal in Iceland (or so we were told). Gray storm clouds filled the sky with the occasional slender beam of sun that would seep in through an opening above. In the early hours of the morning, we were picked up at our hotel by our dive guides and shuttled to Thingvellir National Park. The van was full of people from all over the world, who like us, had traveled far and wide to experience the magic of the Silfra. On route, the friendly guides introduced themselves and enlightened us with some information and history on the rugged landscape that surrounded us. 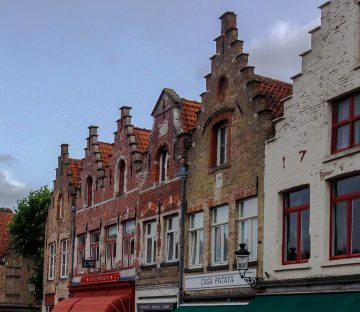 Any Game of Thrones fans will be stoked to know that we even passed by many of the outdoor battle filming locations used in the famous HBO T.V. series. Upon our arrival at Thingvellir National Park, our first stop was at the registration office, where we had a chance to stretch our legs, and the dive outfitter registered our group for the day’s diving activities. 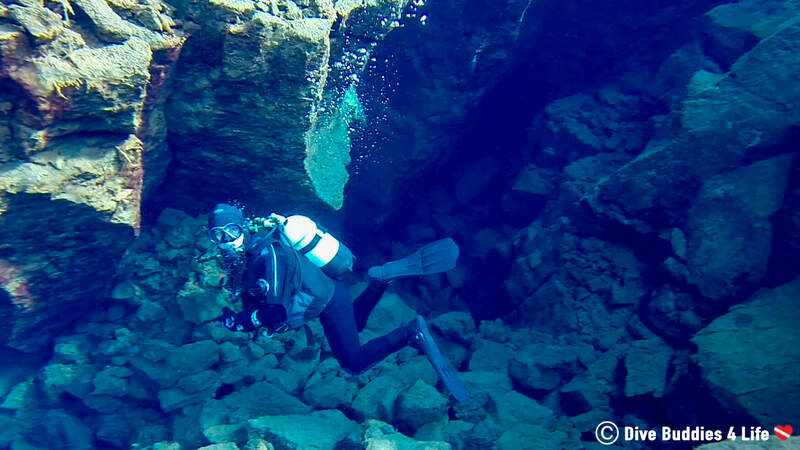 Then it was onward and forward to the Silfra! We pulled into the dive site, and I could see right away it was a busy beehive of activity with groups of both snorkeling and diving tours getting in and out of the water. I could not believe how many brave souls had come to torture their body in two-degree glacial waters. 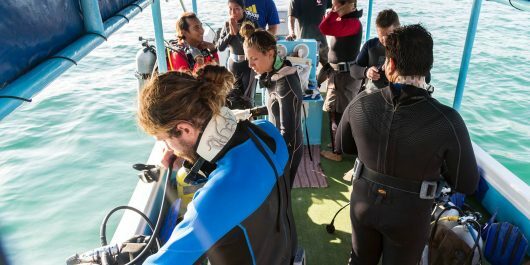 At such a pricey dive, it was convenient nice when our two divemasters insisted on taking care of all the heavy lifting and set up most of our equipment. It gave me a chance to soak in my surreal surroundings. As we waited on our equipment preparation, we were given a quick dive briefing and a little geography lesson on the landscape before us. Like a sponge, I sucked in the knowledge to no end. Following the dive spiel, the moment had finally come. 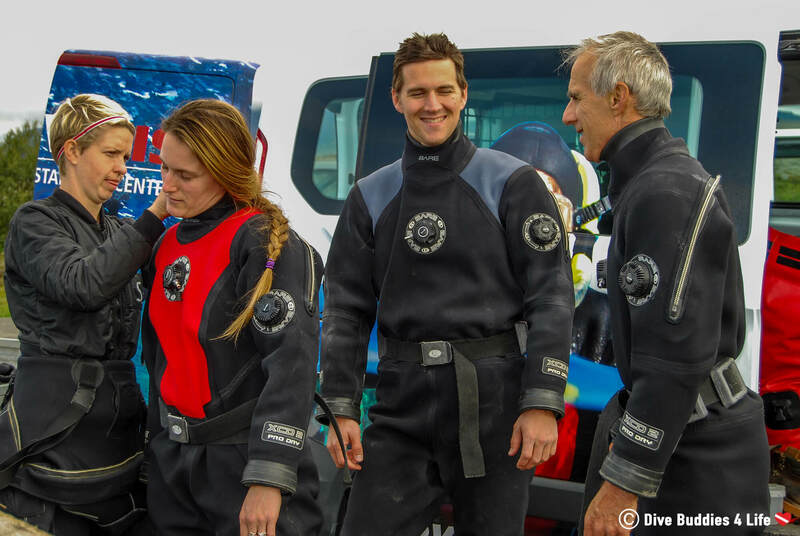 It was time to suit up in our dry suits. Even from the shore, you could see far down into the depths of the Silfra crevasse. Once our group was good to go, we descended the metal staircase into the water. 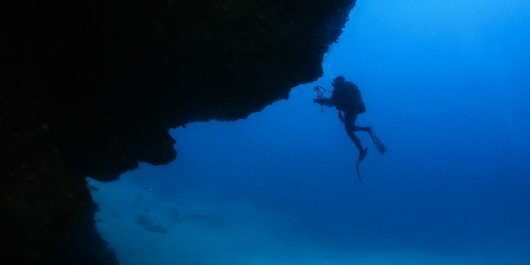 At about waist height there was a dive platform, which divers could get mask, fins, and regulators in place before sinking into the waters below. First putting my head in literally took my breath away. Instantaneously, my head started to hurt from the cold piercing through the neoprene hood I had on my head. 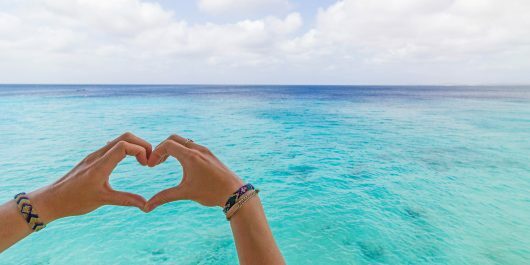 My toes curled and my teeth clenched together as that brain freeze took over my body, a sensation that would stay with me for the entirety of the dive. Eventually, my body got used to the unpleasant sensation, and I started to look around and take in the towering rock formations around me. 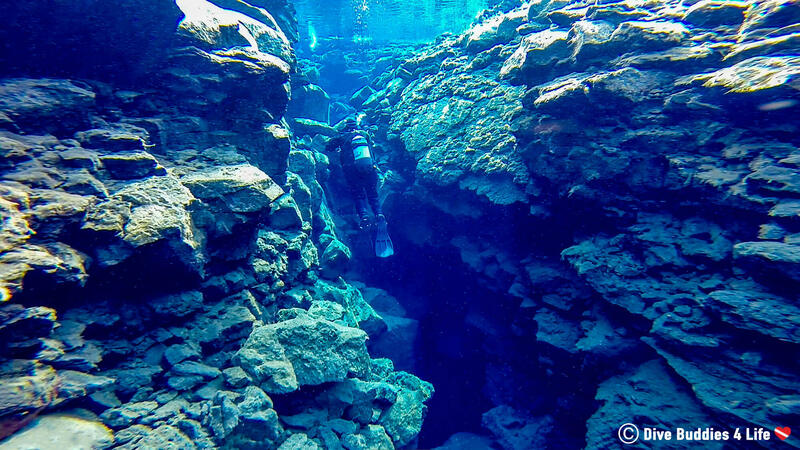 The Silfra was no ordinary diving place. Far in front of me, the continental divide stretched off into the distance as far as the eye could see. To the right, to the left, and many meters down, all I could see was bands of blues with nothing getting in the way. Suddenly the cold and cost of the dive feel like a worthwhile trade-off. Porous jet black volcanic rock makes up a good portion of the Silfra as we pass through the Big Crack and into the Silfra Hall. As much as I searched, I couldn’t find a single fish species as we drifted down a little deeper into the fissure. The only life forms I observed in the crack was the flailing bodies of divers and snorkelers bobbing around in drysuits. Peppered all over the lava rock was lime green algae or “troll hair” as the guides like to call it giving a splash of color to this magnificent aquatic landscape. We arrive at the section where both the North American and Eurasian plates are close enough that while diving we can touch both sides. What a fantastic feeling, to not only learn about unusual geological occurrences but to also experience one. Joey, Dad and I each take our turn posing touching both cave sides. After all, our photographs were taken we continue swimming towards the section of the Silfra known as the Cathedral. The Cathedral is a big open chamber that reached a depth of about 66 feet making it the deepest point of the Silfra dive. The sun must have decided to come out because small rays of light radiated off the pure white sand at the far end giving an illuminating appearance to the water around us. The glacial current continued to push us along gracefully, through the pearly stillness of this divine section, and onwards through the waters. As the rocky walls tapered down, the divemaster made a sharp left handed turn from the Cathedral navigating away from the current pushing us towards Thingvellir lake. Our group followed, not wanting to be swept into the center of the lake and needing to be rescued by boat. Quickly navigating between rocks that barricaded the way I floated into a picturesque lagoon, the endpoint to our dive. 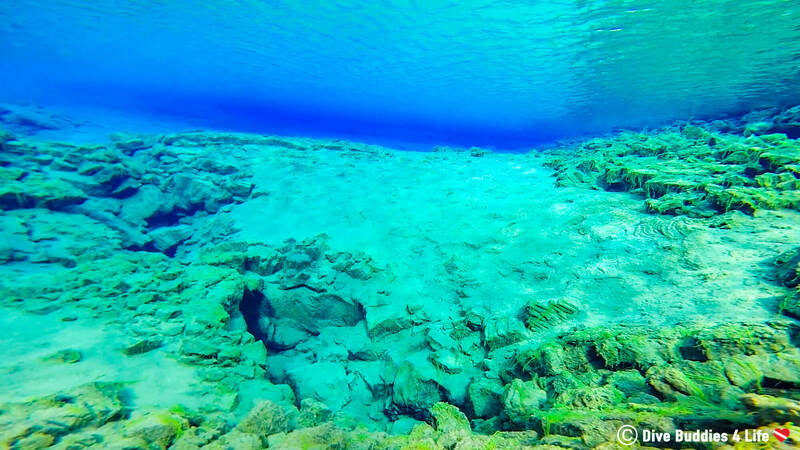 Just look at the unearthly green and blue colors of this water pool. It was unlike anything I had ever seen before! The first dive lasted about thirty minutes, but in that thirty minutes, I was already having a hard time with my finger dexterity. Don’t get me wrong dry suits are great at keeping you dry, but what they don’t do is keep you warm. Warmth is all in the insulation and layers of clothes you put on under your suit. Some much-needed cookies and hot beverages were served between dives while we took our surface interval. The guides swapped out our tanks much to my relief, as I couldn’t feel my fingers let alone deal with fine-tuning all the valves. After what felt like seconds it was time to freeze our butts off all over again. I had only just started to warm up from the first dive. Our second dive was a lot shorter than the first, with a bottom time of only about 20 minutes. I think it was a record for the shortest dive I have ever done. By the time we surfaced, rain was falling like pins and needles on the ground. I was so cold I could barely walk myself back across the street to our van. Who would have thought my limbs would feel like popsicles after only an hour of diving in a drysuit. Somehow I made it there and managed to disassemble all my gear. Shore support mom was ready to bundle me up in any extra clothes we had and got us all hot chocolate to warm our bodies from the inside out. It took several cups of hot chocolate and a good night’s rest buried under a mountain of blankets before the chill of the Silfra left my bones. Call me crazy, call me suicidal for putting my body through all that torture, but as an adventurer at heart, some experiences are worth the frostbitten limbs. 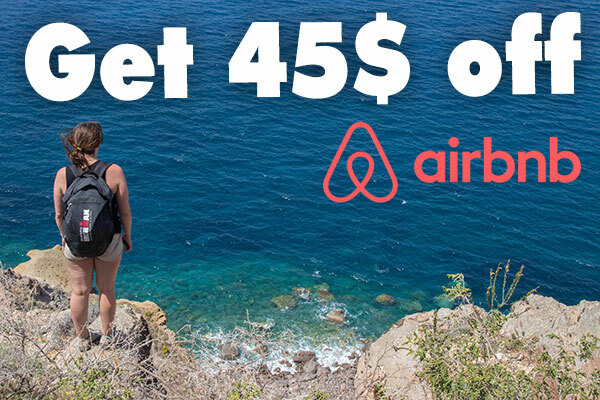 Cost: It’s not rocket science if you are going to dive one of the top scuba diving sites on the planet you are going to pay for it. 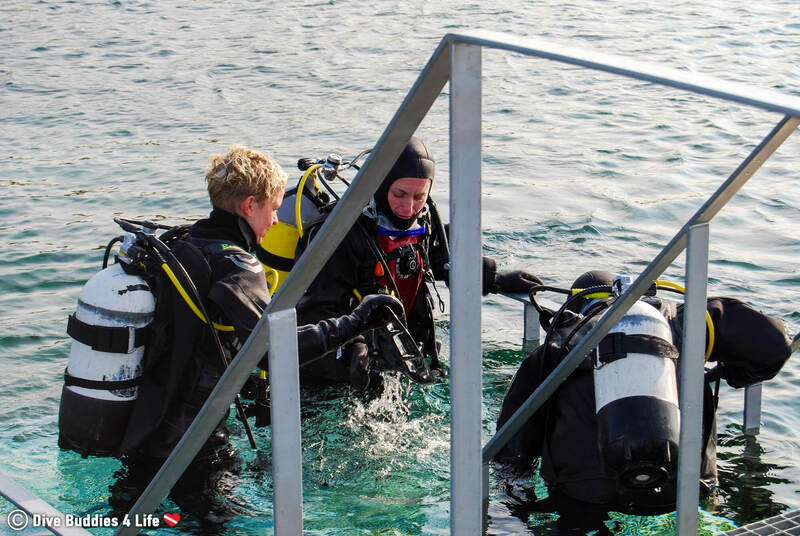 Expect to pay approximately 44, 990 ISK (about $515.00 CAD) for equipment rental, transportation to and from the dive location (45 minutes from Reykjavik), National Park fees and two dives if you are a seasoned dry suit diver. 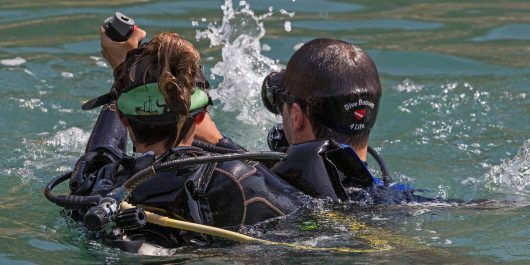 For those who have never gone scuba diving in a drysuit and need to do the course, the cost can be as much as 99, 990 ISK ($1,195.00 CAD). 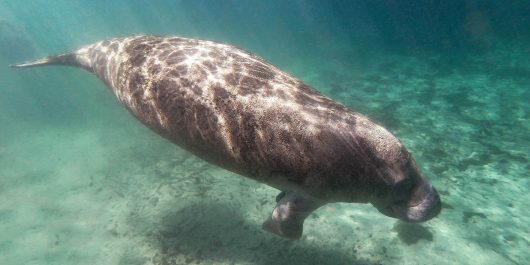 Divers start saving your pennies! 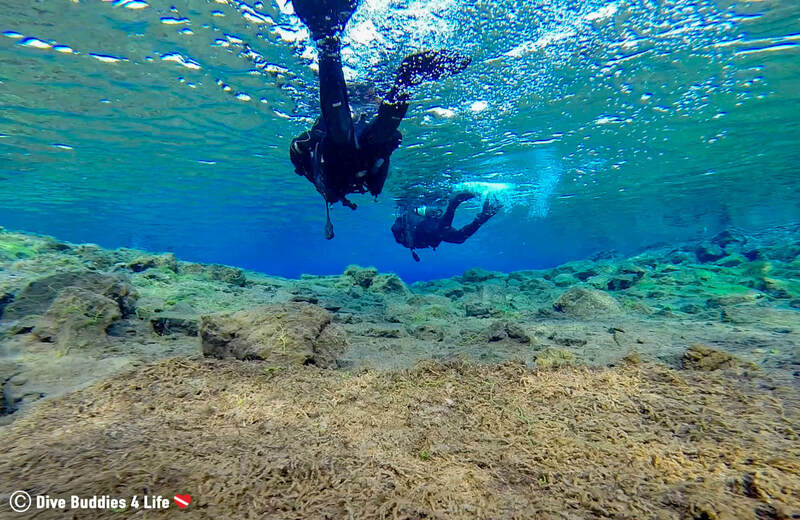 Seasonality: The first question that most scuba divers ask when considering a dive vacation is; when is the best time of year to dive the Silfra? The great news – there is no best time. 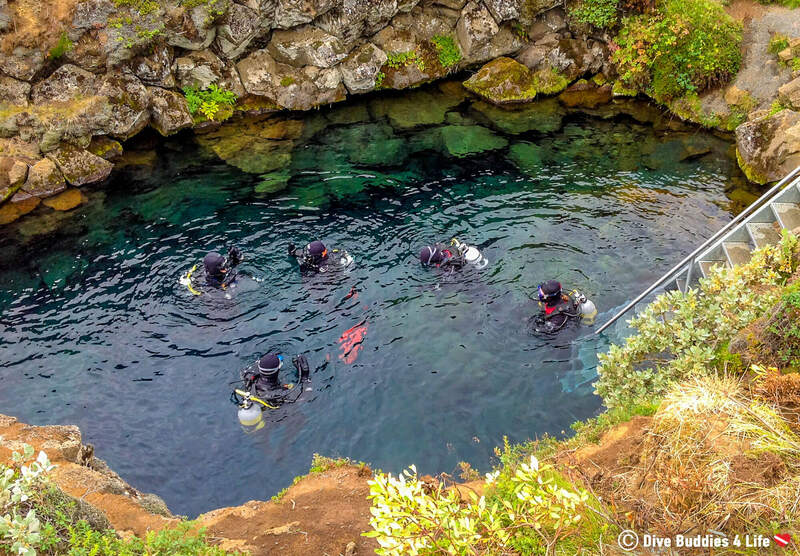 There are perks to diving the Silfra during any season and in any weather. If you are looking for calmer weather or diving under the midnight sun head to Iceland in the winter time. 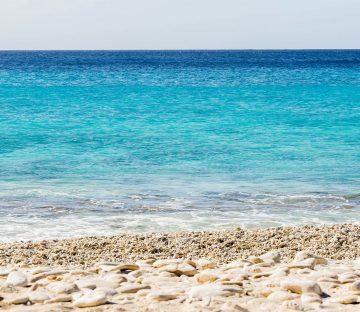 If you like diving with fewer crowds consider the spring and fall months. 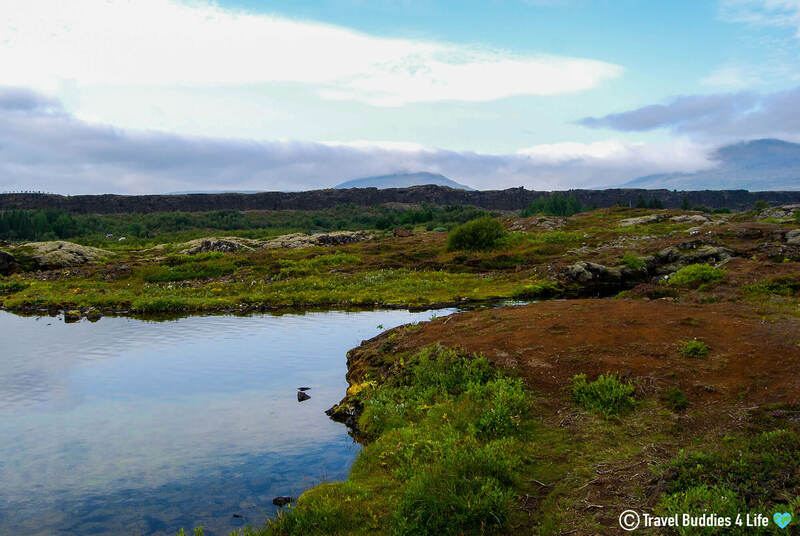 If you’re looking to hike, camp and do a bunch of other outdoorsy stuff above and beyond the Silfra, summer is probably your best bet. 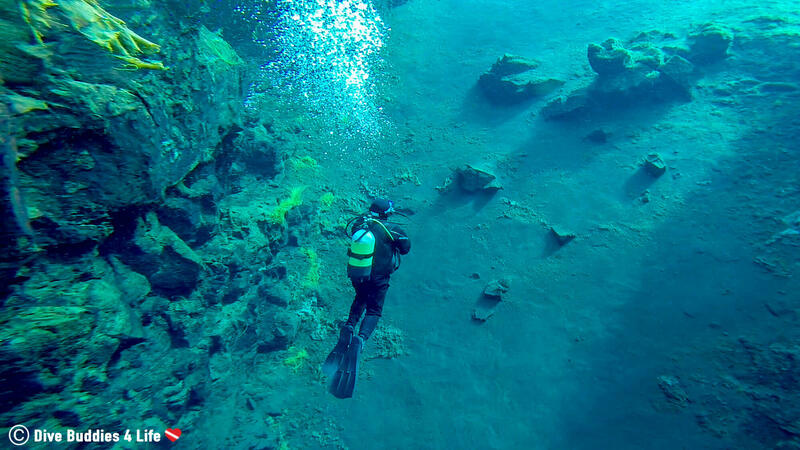 Companies: Iceland has many different companies that offer scuba diving and snorkeling tours of the Silfra fissure. We decided to go with PADI five star DIVE.IS. Take a look online, book in advance and figure out which one is the best fit for you. *There are also plenty of other private lesser known companies. 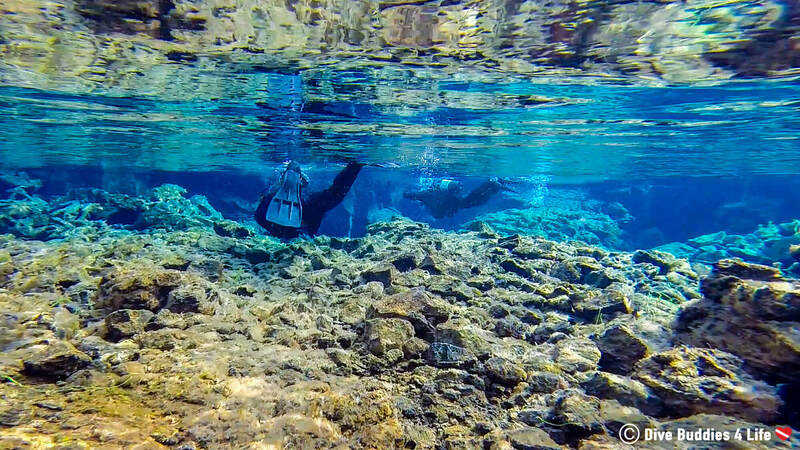 Brrrrrrrr, dipping into the Silfra was chilly, it brings me brain freeze just thinking about it. 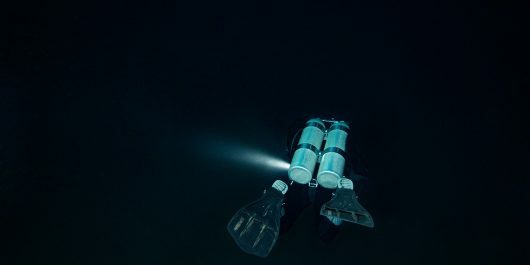 What is your coldest scuba diving experience?